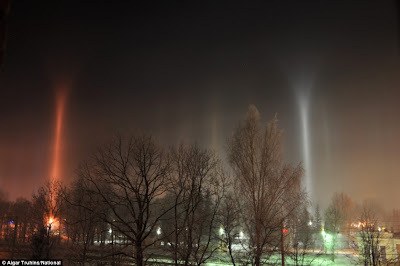 Scientists are left baffled seeing these mysterious beams of colorful light appear in the night sky sometime in the last week of December in the town of Sigulda, Latvia. Taken by designer Aigar Truhins with a standard digital camera, the photographs have prompted excited online discussions among amateur astronomists all over the internet. 'My son exclaimed, 'The Aliens are coming!'' Truhins was quoted as saying. 'It certainly looked that way,' he added. But experts are agreed there may be a more prosaic explanation - ice crystals in the air. The air above the town was notably cold and filled with suspended ice crystals. It is believed that the columns were formed by those reflecting light from the bright streetlamps and other lights on the ground - beaming it back downwards again. Skies all over Europe have been filled with such natural phenomena during the cold snap of recent weeks. 'These pillars are mysterious. They have unexplained curved tops and even curved arcs coming from their base. 'Arcs in rare displays like these could be from column crystals to give parts of tangent arcs, others could be the enigmatic Moilanan arc or even the recently discovered reflected Parry arc.